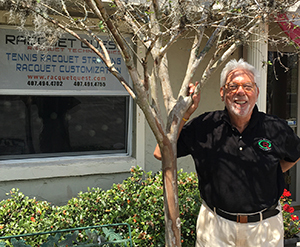 Master Racquet Technician John Gugel is adamant about the problems with poly string - especially for junior players - and has even been known to decline to string racquets for juniors with poly string. He says it is the job of a racquet technician to advise his or her clients on proper string choice - whatever the string - and that doing so is good for business. In a recent column in Tennis Industry Magazine on the problems with poly-based strings, USRSA Executive Director Bob Patterson said, "Not only is poly string wrong for most recreational and junior players, it can be harmful." He noted that while top pros may be able to get more spin with poly strings, most recreational players cannot. What they do get is less power from the strings and increased shock to their arms and joints, often resulting in injury. But his main point in the article is that this is a common problem, well-known within the racquet stringing community, and one that we all need to address. In fact, his title for the piece is, "Collaborative Effort: When it comes to poly strings, we all need to make sure adult recreational players and juniors know the facts." We couldn't agree more, of course. We have also written a number of columns about the problems with poly, and how the alternatives, such as the PEEK polymers used in our MonoGutTM ZX series, can generate as much, if not more spin than poly, but without the risks. PEEK polymers - the best known of which is Zyex®, which we use in a number of strings, including MonoGut ZX and ZX Pro - have a number of properties which make them well suited for racket strings and, we believe, a better option than polyester. These properties include low dynamic stiffness and a low coefficient of friction. These combine to allow the strings to easily slide across each other and snap back forcefully, generating spin. The same ability to stretch and snap back forcefully generates shot power, which polyester does not do, and increases 'dwell time' of the ball on the strings, enhancing control. Finally, PEEK has an excellent ability to retain tension longer than other materials (polyester does not), increasing the playing life of the string. Our good friend, Master Racquet Technician John Gugel is also adamant about the problems with poly string - especially for junior players - and has even been known to decline to string racquets for juniors with poly string. John's business is referral based so his clients are normally predisposed to making a change. "If we receive a call from an unknown player who uses - and will supply - polyester string, we decline unless they show an interest in hearing alternatives. We really try to help players avoid arm issues, so why would we want to continue what may be a bad application?" But John also puts the issue in a wider context. He says it is the job of a racquet technician to advise his or her clients on proper string choice - whatever the string - and that doing so is good for business. "Anybody can be an order taker," he said, "and a robot could probably be programmed to string a racquet. If you work that way, you build no customer rapport and consequently, no customer loyalty." Your business, he adds, devolves to a simple matter of price. On the other hand, working with a customer to find the right string does build rapport and loyalty. It demonstrates your expertise, which is your true value, and keeps the customer coming back for more, and making referrals. But how do you do that? We're stringers, not coaches. Other than the obvious of not recommending your thinnest gauge string to a player who looks like the Hulk, how do you figure out what string is best for any particular customer? 1. Have you had, or do you currently have arm issues (wrist, elbow, shoulder)? John says one key issue is dealing with coaches who aren't familiar with the many string alternatives. Many are "sponsored" and, necessarily, will promote the brand that gives them string. But that's not the only problem. "Recently we switched a very good player to Monogut ZX from another good multifilament," he said, "because the coach wanted her to hit with more 'spin.' She later called saying her coach looked at her racquet and said she should not use this polyester! Had she not called she would have changed string again and believed that Monogut ZX was polyester even though we had the discussion prior to setting it up, and, the racquet tag had Monogut ZX as the string." So, we also need to work with coaches to get better stringing outcomes. It is certainly not a good idea to bypass them. But then, if players are in pain they are not going to be taking lessons from this or any pro! As Bob Patterson says, we need to make sure everybody knows the facts, not only about poly, but about the alternatives. Zyex® is a registered trademark of Victrex, Ltd.